It’s been a year of inspiring originality across the board, interlaced with some vivid new takes on classic stories. 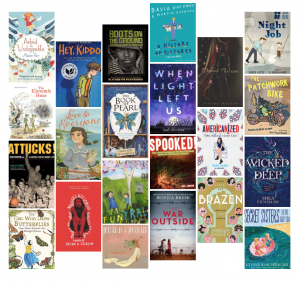 It’s a particularly good year for female subjects, with complex portrayals of girls dominating the ﬁction list and several compelling biographies (and one autobiography) scaffolding the nonﬁction; picture books are strong on the celebration of bonds, whether with grandparents, parents, or new friends. Since only books that can stand as independent reads are eligible for Blue Ribbons, be sure also to check out our period Series Spotlight feature, where we highlight literary achievements whose impact requires two or more books for full force. In the meantime, you’ll ﬁnd something for just about every young reader here. You can download the brochure of the full list as well. Henkes, Kevin. A Parade of Elephants; written and illus. by Kevin Henkes. Green- willow/ HarperCollins. 6-24 mos.